Nutrient-rich greens, topped with a lean steak, make this salad an open book of healthy choices. Then make the salad pop by dressing it with the Lemon-Pepper Vinaigrette. For the salad, toss mushrooms, spinach, shallots, parsley, and mint in a bowl. For the steak, cook bacon in a large sauté pan until crisp; transfer to a paper-towel-lined plate to drain, then toss with spinach salad. Sear steak in pan with bacon drippings over medium-high heat to desired doneness, 6–7 minutes per side for medium-rare. Let steak rest 5 minutes; thinly slice against the grain into strips. 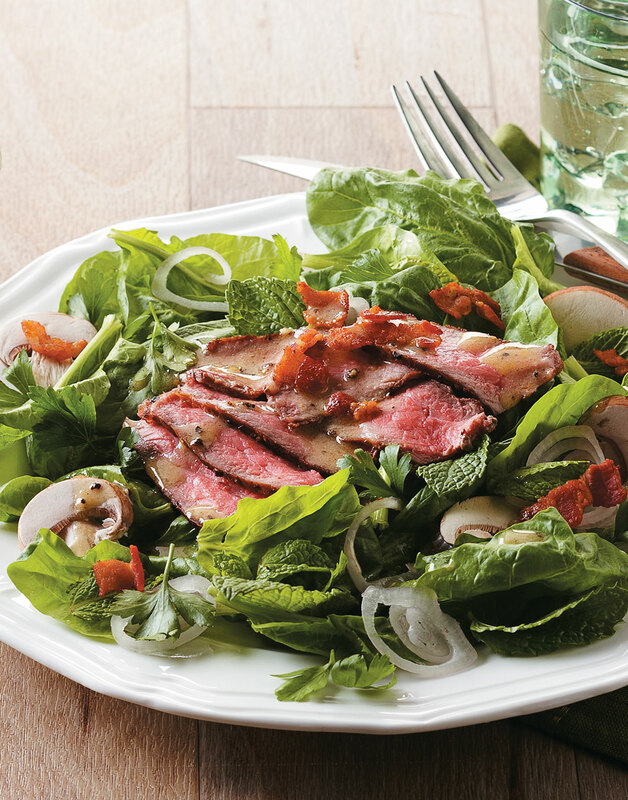 Serve salad topped with steak strips and Lemon-Pepper Vinaigrette. Mushrooms only require a quick wipe with a damp cloth to clean before preparing or eating. Quickly slice mushrooms by running them through a food processor fitted with the thinnest slicing blade.